Just before the havoc of the holidays began, my thoughts were that I might return to school and earn another degree. One that would enable me to use my unfortunate experience in a more professional way. I didn’t know if engaging in coursework was necessary nor, which identifying initials behind my name would render me certified to counsel others. (MSW, LPC, SW, CPL just to site a few) Trying to iron all of this out, I decided to consult with several counselors in the community. I choose three individuals that I thought might influence and inform my decision. Seeking them out, I scheduled appointments with each. My first meeting took place in a coffee shop. A therapist by trade but, also a life long friend, Melanie told me what it took to get where she was today. Herself having a story to share. At times, a painful journey that led her to pursue a profession where her experiences of suffering could support someone else. At the time, all I could do was talk in general terms. Carrying my own set of experiences, I was still soul searching, for the best ways to reach and teach grief-stricken souls. Yearning to know the specifics and continuing to open myself up to a preordained path, my questions centered on varying types of degrees and what each would allow me to execute. How many school years would it take and would it be worth the money and time invested. Where would I work and would I need my own office space. By the time I capped my caffeine consumption, I had received the information sought about schooling. Our discussion had been full of details but, at the end, no decision had been made. Melanie’s last statement to me was, “It will be interesting to see where you end up.” Her words were encouraging; not ones meant to mix me up. However, they brought no defining destiny. When we parted, I sensed that returning to school to earn a professional degree was secondary to something the Spirit was insisting that I do. Even with this inkling, I sought out the second person to meet. I was familiar with who she was, but we hadn’t met face to face. Still a stranger, in a sense. I knew she was an activist in our community, supporting many lost souls and leading them to the Living God. Somewhere along the way, I had been exposed to her story. Looking at her life now, I knew she was more than just surviving. Instead, fueled by her own testament, she spent her days steering the souls of unwed mothers, counseling those seeking relief from suffering and reaching her healing hands into the community. Watching from a distance, I saw a woman of action and involvement. I was able to introduce myself early one morning when she allowed me to sneak in after a meeting with her staff. Shaking hands was the start but, what followed was the real beginning. I explained the information I sought; What did her previous path look like? Did she attend school to certify herself? How did she organize her experience so others could tap into her testimony?. Her schedule is demanding so, we didn’t have time to cover all the specifics. Nonetheless, I gleaned what I needed to know to take the next step. Unbeknownst to me, she was in attendance at The Woman of Hope Conference where I shared “Samantha’s Story” for the first time. Abbey attested to the power and providence of my experience. Proclaiming, that returning to an educational institution was not what I needed to do. Instead, she affirmed that I had passed enough tests, ones harder, requiring more endurance, discipline and commitment than anything that could be achieved on a piece of paper. Testifying, that Jesus is the Great Physician, The Great Counselor and that is what people needed to know. Once again, inserting her helping hands into the lives of learners, we scheduled a time to continue our conversation. Stating, we were Sisters in Christ and helping me was the least she could do. Three weeks later, every obstacle imaginable surfaced and tried to interfere with our time to talk. Feeling flustered, I pressed in and conquered the attempts to dissuade me from arriving on time. Walking into the room, I knew it would be inappropriate to cave into all that had gone wrong while getting there. Instead, a peace prevailed and I calmly expressed my gratitude for grace. I was greeted with a warm welcome, invited to sit down and settle in. We opened in prayer. My sense of hearing on high alert, enabling me to receive the wisdom in the room. Rambling, I retold how my head and heart were beating up against each other as I sought the path in finding the purpose in my pain. All the while, Abbey held the Bible in her hands, counseling me with the written Word. She uncovered within me a doubt concerning the worthiness of sharing my story, a fear of what others would think of me when I exposed my experience and the possibility that others might question the authenticity of what I said. Maybe even more than that, challenge me, cornering me into an uncomfortable confrontation because of the my lack of biblical knowledge. The woman sitting before me addressed all of my issues with targeted truth. She lead me to scripture each time that identified my emerging emotions and in turn, clear instructions on how we are to overcome them. Clearing up any confusion about whether I was to stand in fear or follow in faith. She released the feeling of confinement when insisting, I wasn’t responsible for the outcome. That some folks would hear and others wouldn’t. But, that wasn’t up to me. With that established, our conversation turned to ways to give identity to JustDoToday.org. Squeezed amongst all that she said, I was comforted by her comment, “Elizabeth, you remind me of myself 10 years ago. Continue to sit before the Father and He will lead you.” All of the sudden, I knew what to do. Stopping her mid-sentence, I confessed our conversation could end because I had just received my next set of instructions. “Write a letter!”, is what I heard. Abby raised and lowered her chin in agreement. Encouraging me to tackle the next task. Prayer was how we parted but, it wasn’t without homework on my part. 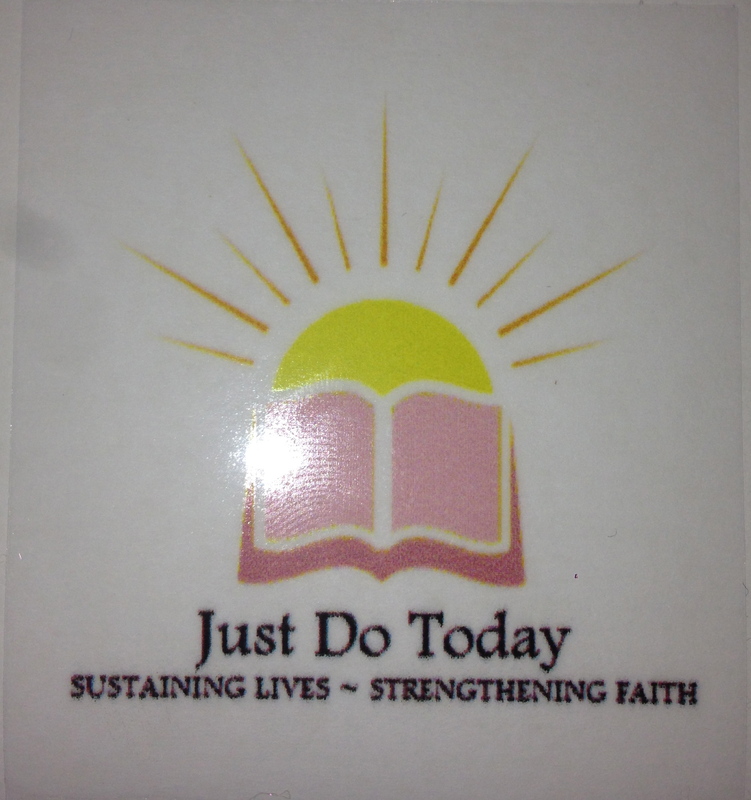 In order for the world to recognize JustDoToday.org, a tag line, a logo and possibly a non-profit would be required. The third step is a tough one. As of yet, I am unable to wrap my brain around the idea. Immediately, I went to work on the things that seemed doable, creating a combination of words and perusing through appropriate images. While working late into the night, everything came together. Quickly, JustDoToday.org had a purpose and a picture. Next step, write the letter. Sitting down and sifting through what I wanted it to say, I outlined my main thoughts. Working with a friend, we arranged the words, organized the paragraphs and penned a page size letter explaining why and what I am being led to do. Putting all the pieces together, I was ready to run my first copies. Walking out of Office Depot, I knew I was about to make myself vulnerable to the world. Since then, I have mailed out 40 letters to local and out of state pastors, varying grief groups and individuals whom I know play a part in the spiritual development of others. Each day a new group is placed on my heart, I respond by connecting with them so I can share “Samantha’s Story.” Today, it is time to share the letter with those of you online. Please read it and if you know of any gathering, group, conference, retreat, etc. whose lives would be sustained and whose faith would be strengthened by listening to “Samantha’s Story”, please contact me. P.S. – I believe this blog was for my benefit. Like the old days of http://www.my_walk_with_thee.blogspot.com, there are times when I just need to write. When I do, the golden thread that is weaved throughout the ordinary events in my life, stands out and shines. But, boy, do I have something to share in my next post! Oh, there are many scriptures resounding within me!!!! The LORD says, “At that time young women will dance and be glad. Young men and old men will rejoice. I will turn their grief into gladness. I will give them comfort and joy in place of their sorrow. What an incredible experience to be a part of The Kingdom! Previous For her …. For Him. Liz, this is awesome! I am SO excited for you and look forward to hearing about all that God has planned!